Adapter source - seal ring block to 5/8, AN12, etc. Looking for an adapter source - seal ring block to 5/8" or.. Sadly, Doc's Blocks went out of business about 3 years ago. 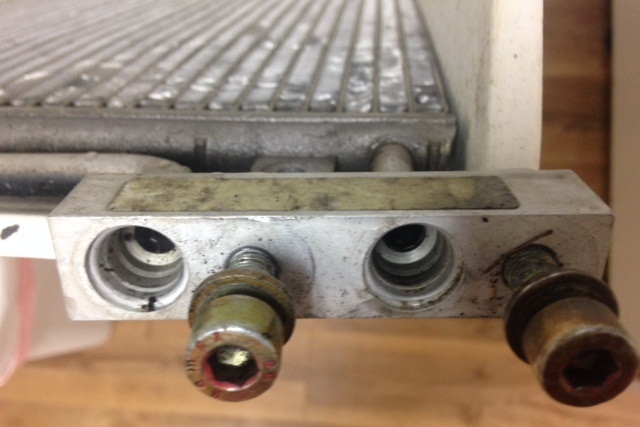 You say the condensor has a block fitting - what attached to it? got pics of what you are trying to accomplish? That looks like a standard "Peanut" fitting. TIG welding AN fittings to he mating part works, but you would be better off using refrigeration fittings & hose. AN flare fittings can be a challenge with refrigerant, and you need to use teflon hose. Refrigerant barrier hose & "O" ring seals are better suited to this job. He still needs to add a lot of pics, so calling him might be faster. Whole site needs a lot of images added. Once I get my move done I work on a few things. With 12K of items listed now. I may take some time to add them all.